Playing with gravity: PM friends figure out how to raise the track. Last week I was preparing to say goodbye to a months-long inquiry project as new interests took over more and more space in the room. I was prepared to pack it all up, but there was still some heat left in those coals, and a new idea has now sparked and caught on in the afternoon class. I suppose the story is ongoing. 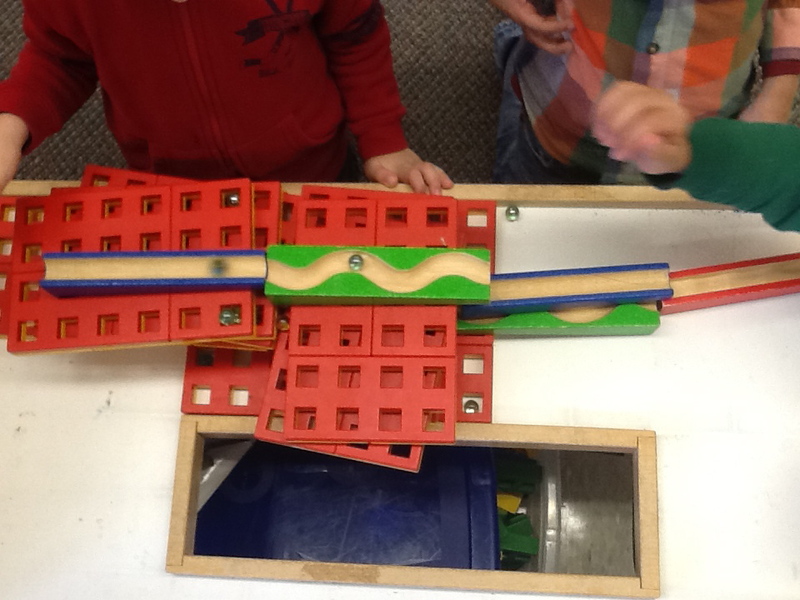 A new marble track growing in a new space in our room. 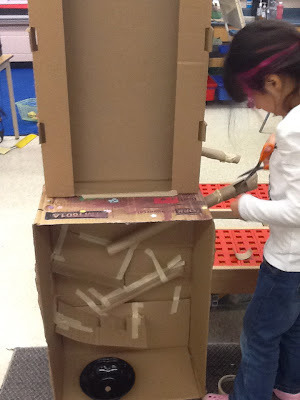 In my first post I wanted only to focus on the beginning of the inquiry, the exploration stage before students truly began to take ownership of the materials and started to build their own mazes and marble runs. In the Voicethread story, the children describe their play from the initial engagement to exploration, then into the beginning stages of investigation and communication. I have continued to capture the inquiry through photos and documentation in-class, but only this week noticed that our interest in the Voicethread had faded, and therefore I have not uploaded any new pages in a month. I think our book may just be finished. Here again is the early days of our story, told by my students through photos, movies and their words. The marble centre began to get quite interesting when it spread from the original table and carpet area to include tubes and tunnels. 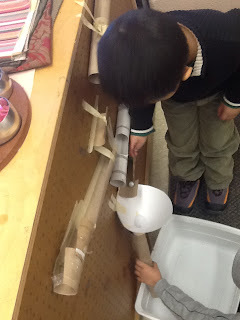 I noticed the students were less likely to use the pre-made toys, once they started to fashion marble runs with cardboard, scissors, and tape. While I enjoyed this stage more than almost anything we have done this year, I regret that my involvement in the play resulted in many pictures but less anecdotal notes (in the form of student quotations) than I usually capture. I do wonder if the full-day program, with two educators in the room dedicated to capturing and documenting daily life, will result in less gaps. On a happy note, I do feel like I know my students better this year than I ever have, and the quality of those relationships stems from a genuine love of the interactions. I know each child's strengths and challenges, interests and skills intimately, simply from being a part of the process. While I do wonder about the possibilities open to those in full-day Kindergarten programs, I do love the interactions possible when you have two classes each day sharing the same space. This picture, for example, is a wonderful illustration of how the AM students interact with the artifacts of the PM project work. Here at the left, E is experimenting with a funnel that I made (upon request) to change the direction of the run at the bottom. R is holding another tube at the bottom to prevent runaway marbles from escaping the tub and rolling away under the cabinet. For the curious: yes, marbles do get into every nook and cranny in the room! 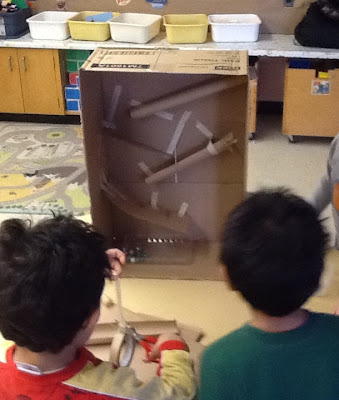 The morning friends enjoyed exploring the first maze and adding their own innovations. It wasn't until I found some large boxes, however, that they realized we could create our own permanent maze structure. This was a fascinating process, inspired by YouTube clips and the PM version on the back of the cabinet, and changed many times as the tape came undone or new ideas came up. N and A directing me as I help add a shelf to our new maze in a box. A, H and A testing each added shelf and tube with a marble before securing with tape. 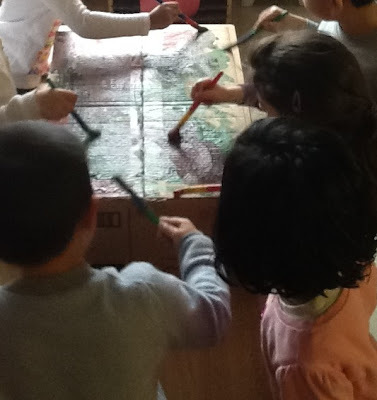 A group of AM friends paint the maze with the colours they have blended together. Principle 5: Play is a means to early learning that capitalizes on children’s natural curiosity and exuberance. Play is a vehicle for learning and lies at the core of innovation and creativity. It provides opportunities for learning in a context in which children are at their most receptive. Play and academic work are not distinct categories for young children, and learning and doing are also inextricably linked for them. It has long been acknowledged that there is a strong link between play and learning for young children, especially in the areas of problem solving, language acquisition, literacy, numeracy, and social, physical, and emotional skills. 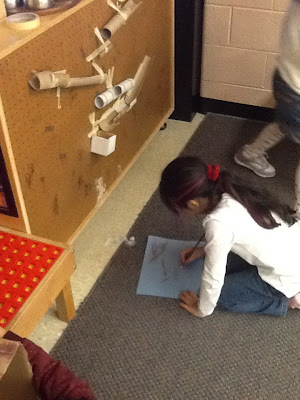 Young children actively explore their environment and the world around them through a process of learning-based play. When children are manipulating objects, acting out roles, or experimenting with various materials, they are engaged in learning through play. Play, therefore, has a legitimate and important role in early learning and can be used to further children’s learning in all areas of the Full-Day Early Learning–Kindergarten program. It is so important that the United Nations has recognized it as a specific right for all children (“Fact Sheet: A Summary of the Rights Under the Convention on the Rights of the Child”, Article 31, http://www.unicef.org/crc/files/Rights_overview.pdf, accessed February 11, 2010). I can think of no better example of the problem-solving capabilities of my students than the way they have embraced writing notes and drawing diagrams to communicate between the classes. Two AM friends worked together to compose a letter to the PM class friends who built the first run. A PM friend makes a diagram of the run so that we may share it with others. Adding another level to the marble condo! Connecting the marble box to the wall run: several builders were needed to make the steps that A is using. Recording our explorations is a regular part of our class, from the beginning of the year with my ipod and school flipcam, to the now ubiquitous iPad with its camera, capture apps and video capability. While our school supports our 21st Century teaching and learning with iPads for our use, I became smitten with all that I could do with the children and bought my own for classroom use. Students often search me out when I'm playing with someone else so that I can capture their discoveries. Sometimes they simply ask for me to set up "vine" so they can take their own video clips to share with followers at home (I shall save these fascinating scenes for part three). 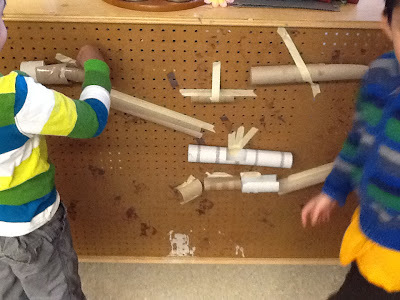 One of those discoveries sparked a new direction for our inquiry: musical marble play. Here is a snippet of what came about one afternoon during our activity time. F: "Look, I can make music!" (he rocks a cardboard tube filled with marbles back and forth). N: "Me too! Listen!" (she pours marbles from a metal cup to a cardboard box, and back, and again). 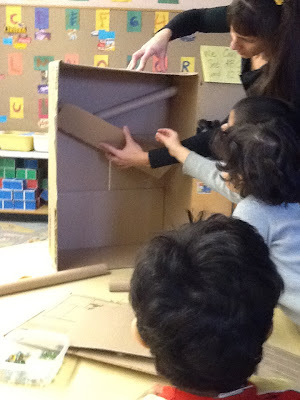 S: "I can do that too"(he pours marbles into a large, empty box). 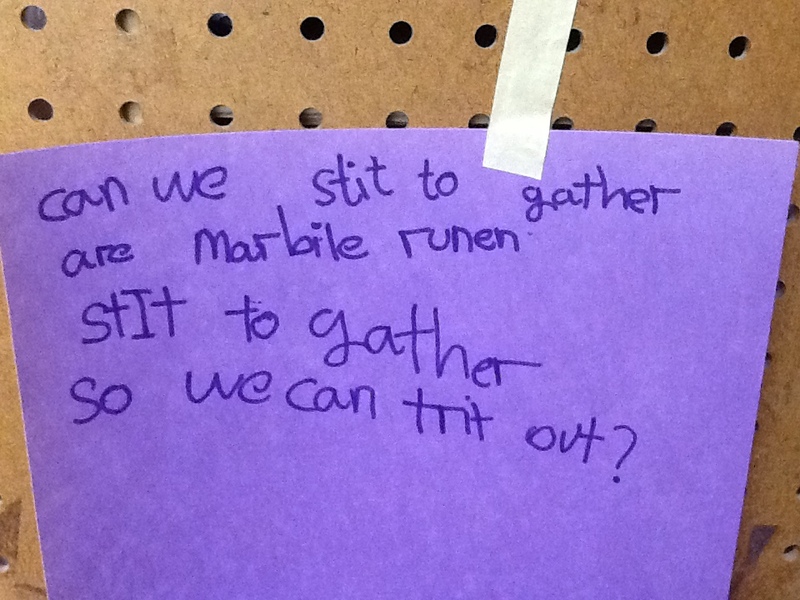 The interest in the musical sound of those little marbles sparked an interest in me as well, and I went looking for other items to bring to the class to provoke new extensions to the play. 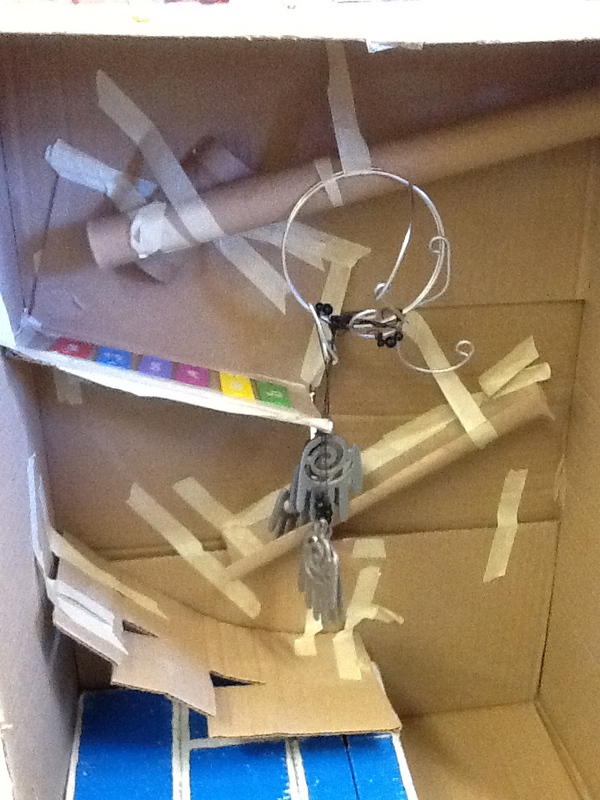 A broken xylophone, pulled apart, led to the musical shelf in the maze shown at the left. The chimes, added later, gave a delightfully unpredictable dimension to the sound play as the marbles didn't always hit them in the same way. Later additions included wooden blocks, glass and metal objects, and a toy xylophone placed at the bottom to catch marbles as they rolled off of the curved shelf or fell through the flaps. This project has been a source of pride for my students who have loved sharing it with visiting friends from other classes, and sharing the Voicethread story with family at home. Next week I plan to share the connections made outside of class, and the exciting new directions this inquiry has taken since last week. This is so inspiring! I can feel the kids' energy (and yours) as I read this post. I understand the frustration of having those "gaps" when documenting. After 2 years of engaging in this type of documentation, it's still messy. I don't know that we ever quite master it, but the "dance" becomes a little more rhythmic (if that makes sense). I can't wait to see what happens next! Thank you! It always means a lot to hear that, but perhaps even more when coming from someone whose blog has long inspired me. I myself started trying my hand at documentation last fall, beginning with a very simple picture story about our exploration of pumpkins. I look at that poster now and I can see what I've learned in a year and a half, during which time I completed my Kindergarten AQ parts 2 and 3 through ETFO. I can't say enough about how fantastic it is to learn in a face-to-face course where we were able to try our hand at documentation, spur each other on with ideas about all the ongoing projects happening in each class, and support each other as learners. By the way, did you happen to click through to the Voicethread? I was curious to know if you'd like to show it to your class sometime, perhaps inspire them to "see, think, wonder" about our project. Our friend Ms. Silva, down the hall, had her students tweet us when we shared some of our magnificant marble creations with them. I almost fell over when I read that tweet, replete with kid spelling! Oops, that's a bit of a preview to next week's post. I wasn't able to view the Voicethread the first time I read this, but I have since been able to. I love it! I haven't tried Voicethread...yet! What a great way to get the children involved in the documentation. Mine are documenting the worm composter and this would be a great way to enhance their documentation. I would love to show this to my class to get their thoughts. Maybe we'll tweet you too!